Allison writes, "Now I know why these candles were just $1.99. Between this lost investment and the losses my retirement plan has suffered in the market, I don't know what I'll do. Man, what a bummer!" I don't know, in the current economy I think those quotation marks are necessary! Imagine how fast they'd be flying off the shelves without those! I agree. These are necessary, are they not? I'm with Duncan, shrubbery and Beth. 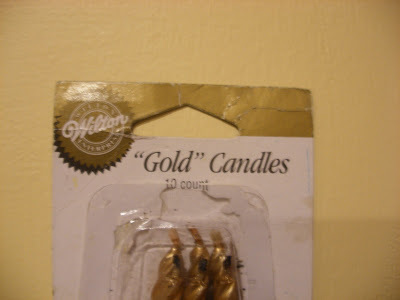 The candles aren't real gold, hence the "gold" in quotes. They belong there. I don't think they are necessary. Does one honestly think that those candles contain a precious metal? Gold is a color too, not just the metal. Candles could contain gold -- in particular, they could be painted with it, which was done in the olden days before more convincing fake metallic paints became available. Relevant to this, I believe Wilton still sells food-grade gold foil and gold dust for decorating cakes and chocolates. And yes, it is actually real gold in those. So, since Wilton does (or did) sell gold cake decor, I could see their lawyers insisting on a bit more clarity for the gold-colored candles.